Ralph Waldo Emerson's dictum - 'The corruption of man is followed by the corruption of language' - belongs to a long tradition of writing connecting political disorders and the corruption of language that stretches back in Western culture. Representative Words, which gives an account of the tradition from its classical and Christian origins through the Enlightenment, is primarily a study of how and why Americans renewed and developed it between the ages of the Revolutionary and the Civil Wars. It is the first comprehensive treatment of the background to and the appearance of the wealth of theories about language in the early era of American political and cultural discourse. 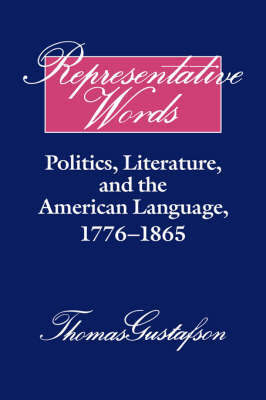 Professor Gustafson's argument demonstrates the interconnectedness of the state of language and the state of society and turns on the question of representation and misrepresentation - whether and how words represent or misrepresent nature, social reality, truth, and value in the new American experiment in representative republican government.